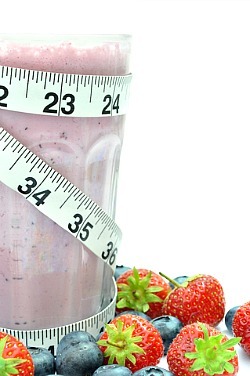 Low fat smoothie recipes are the answer to painless weight management! They can replace a meal or be a high protein, low glycemic snack. You can lose fat, keep your muscle and fit into smaller sizes if you eat more of these weight loss smoothies and fewer potato chips and white carbohydrate foods. Most of these recipes contain low fat plain yogurt which only has about 4 grams of saturated fat per serving. They also have probiotics which are the healthy bacteria your gut needs for proper functioning. They contain flaxseed meal which supports healthy digestion, soothes the intestines and helps with good regulation. It has both soluble and insoluble fiber, lignans, phytosterols, lecithin and minerals and vitamins. These low fat smoothie recipes are easy to make and highly nutritious. When you add the special ingredient recommended here, a whey protein product that targets fat and helps your body to release it these low fat smoothie recipes will actually help you to shed excessive fat. Not only that but the whey powder provides 22% of your daily requirement of calcium and 20% of your daily requirement of protein. This is the only whey protein product that not only targets and allows you to release your fat, but it also helps you to feel quite full. Please note that if you are using a whey protein powder other than the one I recommend you will use only 1 scoop of powder. The fat burning whey is a pure whey product with no extra ingredients that could add unnecessary calories. This is my very favorite breakfast smoothie! It tastes like a super nutritious orange Julius and it is full of antioxidants (also good when you are losing fat.) With a piece of low glycemic, sprouted grain toast you are a good to go! A great smoothie pick-me-up for the afternoon low glycemic snack as well. Combine all the ingredients and blend until smooth. Adding the coconut yogurt changes the flavor a little bit and makes it a more filling smoothie that could also be a meal replacement at night or for lunch. If you drink this smoothie with 1 slice of Ezekiel toast with 1 pat of butter you have your breakfast. Put all ingredients in a blender and blend until smooth. This is another antioxidant power house. This is one of my favorite low glycemic snacks. Combine the almond milk, yogurt and whey in a blender and blend. Add the berries and the rest of the ingredients and blend until smooth. The berries are providing lots of antioxidants for more energy and nutrition. Combine all the ingredients in a blender and blend until smooth. This is a very refreshing drink for a warm day. These low fat smoothie recipes are the ultimate fat loss drinks because of the combination of the whey powder and flaxseed meal. Freshly ground flaxseeds help to stabilize your blood sugar and have many beneficial effects. In East Indian medicine flax is known for it's capacity to support energy production and increase the metabolic rate. Eating too much saturated fat with sweets makes us fat! Challenge yourself to a new way of eating with more plant fats, fruits and vegetables. Reduce your meat consumption (saturated fat) and substitute one of these highly nutritious, low fat smoothie recipes for a dinner at least once a week. * To order the fat burning pure whey protein powder, call toll free 1-855-485-5373. * Sesame butter or tahini not only has essential fatty acids but also contains important phytosterols, iron and calcium. Return from Low Fat Smoothie Recipes to Low Glycemic Recipes. Return from Low Fat Smoothies to Lifetime Fat Loss home page.